Entity Tags: W.R. Grace Co. The World Trade Center twin towers collapse—the south tower at 9:59 a.m. and the north tower half an hour later at 10:28 a.m. [CNN, 9/12/2001; New York Times, 9/12/2001; New York Times, 9/12/2001; Washington Post, 9/12/2001; MSNBC, 9/22/2001; Associated Press, 8/21/2002] The collapses create huge dust clouds that roll through the streets of Lower Manhattan, breaking windows and forcing dust and debris into the interior of surrounding buildings. Scientists who work for the US Geological Survey watch the World Trade Center towers collapse on their television sets. “We sat at home, watched that gray-white cloud roll over Lower Manhattan, and knew damned well that the dust was going to hurt a lot of people,” Gregg Swayze, a USGS geophysicist, will later tell the St. Louis Post-Dispatch. “I knew we had the best technology in the world to determine precisely what was in that dust.” [St. Louis Post-Dispatch, 2/10/2002] Swayze and other USGS scientists quickly get to work making arrangements to use USGS and NASA equipment to determine the composition of the dust clouds (see September 12, 2001). Roger Clark, the astrophysicist who heads the US Geological Survey (USGS)‘s portion of the AVIRIS program in Denver, contacts Robert Green, head of the AVIRIS program at NASA’s Jet Propulsion Laboratory in Pasadena. (The AVIRIS, or Airborne Visible Infrared Spectrometer, is a remote-sensing unit used by NASA to determine the chemical composition of a planet’s surface and atmosphere by analyzing the infrared signatures of minerals that are reflected from the ground and comparing them with the unique peaks and curves of the signatures of thousands of minerals and materials in the USGS database. [St. Louis Post-Dispatch, 2/10/2002] AVIRIS has been used before to scan Superfund toxic sites to map hot spots of harmful substances.) [New York Times, 9/17/2002] He asks Green for NASA permission to use the AVIRIS over New York City and parts of New Jersey to determine the chemical composition of the dust and debris resulting from the collapse of the World Trade Center. [St. Louis Post-Dispatch, 2/10/2002] NASA gives the go-ahead on September 13 (see September 13, 2001). The one percent value is arbitrary because it is not based on safety. Furthermore, it was meant to be applied only to solid asbestos-containing products that do not release emissions (like dust). As the EPA has previously acknowledged, there is no safe exposure level to asbestos (see April 25, 1986) (see April 18, 1989). According to documents that the City of New York later provides to New York State, between eighteen and fifty-two percent of New York City’s transmission electron microscopy (TEM) tests (see November 20, 1990) performed during this period indicate asbestos levels of over 70 structures/sq. millimeter (s/mm2). 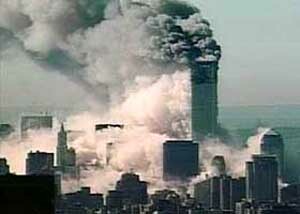 Many of these high test results are based on air samples taken several blocks from Ground Zero. [Environmental Protection Agency, 7/15/2004 ] This figure is similar to the one that Walter E. Mugdan, the Regional Counsel for EPA Region 2, will provide in a speech to the New York Bar Association in January 2002. “Around 35 percent of the samples of bulk dust taken in Lower Manhattan in the first few days after the collapse exceeded the 1 percent level,” he will say. EPA Administrator Christie Whitman announces that the EPA is monitoring levels of airborne contaminants in and around the area of Manhattan. She says that samples so far are “reassuring about potential exposure of rescue crews and the public to environmental contaminants.” The tests “found either no asbestos or very low levels of asbestos.” In Brooklyn, which is directly in the WTC smoke plume’s path (see 9:59 a.m. September 11, 2001 and 10:28 a.m. September 11, 2001), she says that “levels of lead, asbestos and volatile organic compounds in air samples… were not detectable or not of concern.” [Environmental Protection Agency, 9/13/2001] However, her statements contradict results from transmission electron microscopy (TEM) tests that were conducted the previous day (see (September 12, 2001)). EPA administrator Christie Whitman recommends that New Yorkers who evacuated their homes after the collapse of the World Trade Center “vacuum everything, including air conditioning filters, and wipe all surfaces with a damp cloth,” Newsweek reports. [Newsweek, 9/14/2001; Jenkins, 7/4/2003 ] The recommendation is made despite two studies completed for the EPA in 1993 demonstrating that HEPA vacuums do not effectively remove asbestos from carpets and upholstery (see 1993) and that vacuuming actually increases asbestos levels in the air during use (see 1993). EPA and OSHA announce that the majority of air and dust samples monitored in New York’s financial district “do not indicate levels of concern for asbestos” and that ambient air quality “meets OSHA standards.” The two agencies also say that OSHA has new data indicating that indoor air quality in downtown buildings “will meet standards.” The agencies’ conclusions are based on samples taken on September 13. “OSHA staff walked through New York’s Financial District… wearing personal air monitors and collected data on potential asbestos exposure levels. All but two samples contained no asbestos.… Air samples taken… inside buildings in New York’s financial district were negative for asbestos. Debris samples collected outside buildings on cars and other surfaces contained small percentages of asbestos, ranging from 2.1 to 3.3—slightly above the 1 percent trigger for defining asbestos material.” [Occupational Safety and Health Administration, 9/14/2001] But the EPA improperly implies that the one percent level is a safety benchmark (see (September 12, 2001)), even though it had previously acknowledged that airborne asbestos particles are unsafe at any level (see September 14, 2001). Furthermore, its test results are not accurate, as they are based on the outdated polarized light microscopy (PLM) testing method, which is incapable of identifying fine fibers and which cannot reliably detect asbestos when it is present in concentrations below one percent (see November 20, 1990).